Aug. 2 & 3, Frontier Park, West 8th St. & Bayfront in Erie, PA. 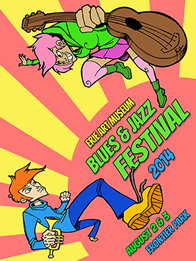 This 22nd Annual Blues & Jazz Fest is the largest blues & jazz event in Northwest PA. Always an interesting and challenging array of national and regional artists, in an outdoor, family friendly setting. The festival extends over two afternoons and evenings. And it's FREE!! Performances will go on rain or shine. Food and beverages are sold at a variety of locations around the listeners area. This is an Erie project which brings together refugee women who have settled in Erie from around the world, to share folk culture, and particularly songs, from their homelands. Songs are to be shared with kids! The project helps women who love to sing and want to work with children. It provides accredited training and orientation to working with children in thiscountry, and helps them develop their skills in sharing their heritage of music. The program has frained over 30 women, many of whom have found employment in local child care centers -- one of the project's goals. Countries represented include Sudan, Somalia, Congo, Puerto Rico, Iran, Palestine, Israel, Ukraine, Russia, Lebanon, Bhutan, and others. Many of the women have studied and learned the songs of each others' cultures as part of the program. The presentation will be child friendly. Bring your younger family members. NOW PUT ON YOUR HEADPHONES, AND LET US GIVE YOU A PREVIEW OF THE GREAT THINGS TO COME, SAT. & SUN. An Erie favorite, the Duke Sherman Band takes the stage at 2 p.m. on Sat. 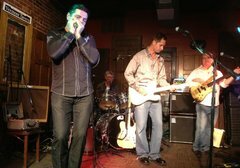 Band members are: Sherman -- guitar and lead vocals, Otis James -- harmonica, Rik Cass -- drums and Mark Murphy -- bass & backup voice. The band has won RockErie awards for best band or best performer in 2006, 2007, 2008, 2009 and 2010. The clip below from the Presque Isle Summer Music Series in 2010 shows you why. The Vernon Jones Blues Cartel. 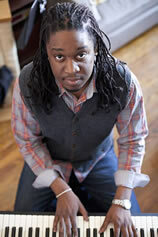 Playing at 4 p.m., the Cleveland-based Vernon Jones brings his ensemble which includes Ree C. Pearl -- vocals. Drummer and vocalist Jones has toured with Robert Lockwood, played with Buddy Miles, Pharoah Sanders and many others. Members of the Cartel are Jefferson Rice -- keyboards, flute & vocals, Bobby Laverly -- guitar & vocals, Chris Hall -- guitar and Lovest Watson II -- bass guitar. Here's a clip from a performance in Ashtabula in 2013. Performing at 6 p.m. is the Heritage Blues Quartet. 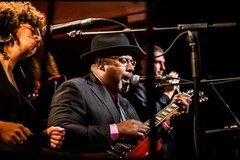 New York City-based, this band is a distillation from a larger group, the Heritage Blues Orchestra, which has toured internationally and across the U.S. HBO repertoire is based on traditional songs from the "Middle Passage" (Clarksdale to New Orleans) and roots music throughout the South. 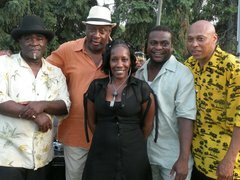 The clip below features Junior Mack -- guitar and vocals, and the group's leader, Bill Sims, Jr., and Chaney Sims, in 2012 in New Haven, CT.
Saturday's headliner, at 8 p.m. is The Lee Boys. AND THAT'S ONLY SATURDAY! NEXT COMES JAZZ!! The Misery Bay Big Band. 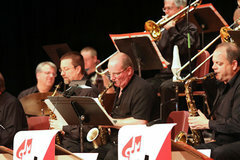 With many original arrangements to perform and superb soloists within its ranks, the band is led by manager/trumpeter Jeff Gibbens and music director/arranger/saxophonist Allen Zurcher. It's a regional treasure. Here's their tight ensemble work and sensitive support are on display with baritone saxophonist Bruce Johnstone and high school student Tim Puglio in 2013's JazzErie Next Generation concert. 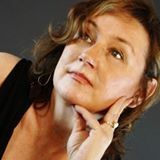 Next in the lineup, at 2 p.m., West Coast-based singer, composer and recording artist Cheryl Hodge wil come to the Festival stage. Winner of the Hollywood Music in Media Award in 2013 for her song "Tree People," Hodge has a string of award-winning blues and jazz songs among her credits. Says Bob Protzman, Erie jazz sage and Downbeat writer, "Anyone with ears would cite Cheryl Hodge as the real thing." She will be accompnaied by guitarist Frank Singer and drummer Joe Dorris. Check out her trio recording of Horace Silver's "Doodlin'", with bassist Jeff Johnson and drummer Jud Sherwood. Steve Trohoske's Jazz Gypsies, featuring Roby "Supersax" Edwards. At 4 p.m. comes Steve Trohoske's Jazz Gypsies, featuring Roby "Supersax" Edwards. Bassist Trohoske is well known in the area for his giant jazz chops and knowledge of the music -- and also for his ability to connect with other regional jazz musicians and bring them to Erie. 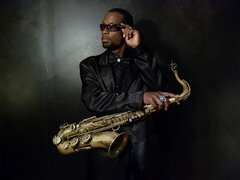 For this concert he brings Pittsburgh native Roby "Supersax" Edwards. Edwards says he has been learning jazz on the bandstand by performing since age 16. He has traveled and performed in 12 countries, and across the U.S. His latest CD, Copacetic," was released earlier this year. A clip of Edwards at a session in Berlin, Germany in 2007 gives a sample of his skills. The tune is "Star Eyes." The George Burton Quartet, with Terrell Stafford and Tim Warfield. Next, at 6 p.m., comes a treat. The Quartet includes trumpeter Terrell Stafford (lauded by pianist McCoy Tyner as "one of the great players of our time," cohort of Wynton Marsalis and many other current jazz greats, teacher at Lincold Center, Julliard, Temple University), and saxophonist Tim Warfield. Warfield needs little introduction to many Erieites who heard him in concert in December, 2013 at Mercyhurst. The George Burton Quartet may show another dimension of Warfield's talent. The band "swings hard, fuses post-bop, avant garde, R&B..." Pianist Burton encouragesmembers to take extended solos, "tell their story," and the results are exhuberent, show-offey, great!! In addition to Burton, Stafford and Warfield, the band includes NYC bassist Noah Jackson and Dr. Wayne Smith. Experience "Eye of the Beholder." Finally, the 2014 Festival brings a truly unique voice, or rather a chorus of voices, to the Erie stage. Canadian saxophonist/flautist, four-time JUNO winner, two-time Grammy nominee, Jane Bunnett brings an all female sextet to celebrate the music of Cuba. 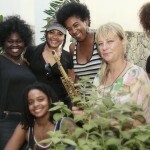 Since 1982, Bunnett, with her own established reputation as a jazz player, has become deeply involved in the music of Cuba. She and husband, trumpeter Larry Kramer, have been traveling throughout Cuba, learning and teaching music with Cuban musicians, sponsoring their performances in the U.S. and Canada. In recent years, Bunnett has gathered a group of talented young women (no small task in macho Cuban musical culture) encouraged their exploration of Cuban "roots" music, fostered their vocal and instrumental artistic skills, fashioning the performance ensemble Maqueque. Here's an audio sample of their work: "Papineau." Wondering about Bunnett's jazz chops? Check this Bunnett and Maqueque at the Lulu Lounge this year. COME TO FRONTIER PARK. ENJOY THIS SUPERB ARRAY OF TALENTED MUSICIANS AND THEIR GREAT MUSIC!